After 10 years of homeschooling, I ordered Sonlight Core F. It was so much easier than my previous years of trying to piece things together on my own! My oldest was at the high end of the age range, and my next daughter a little young … and we totally enjoyed it! We didn't do every book, but we learned so much. To have everything laid out with the Instructor's Guide was a blessing and breath of fresh air! Curriculum is a tool to help us homeschool effectively and Sonlight works wonderfully! Here, Olivia (14), Grace (10), Amelia (7) and Abbey (5) enjoy the biography of missionary Hudson Taylor. Instructor's Guide not included. This is part of your History / Bible / Literature F and Grade 5 All-Subjects Package. This collection of twenty books is included in History / Bible / Literature F. If you don't need notes or a schedule, but are just looking for some excellent supplemental reading about the Eastern Hemisphere, this book collection is for you! From Jules Verne's classic adventure yarn Around the World in 80 Days, to a Saudi Arabian boy who trains a golden eagle to hunt. From the story of the Arabia horse who was the ancestor of the modern Thoroughbred, to a Palestinian girl in Jerusalem who befriends a Jewish boy. From Leningrad, besieged during WWII and slowly starving, to India during Partition – incredible stories about lesser-known times and places. Come fall in love with the other side of the world. Beloved author Carol Kendall (The Gammage Cup), with Yao-Wen Li, sought Chinese stories that they liked. The twenty-four tales they came up with span from the Warring States period (480 BC) through various dynasties (Han, Chin, Ming, Ching), up to the present. This intriguing collection of parables, folktales, and fables includes many literary styles. Some are complex, and others as brief as a joke. Come enjoy the wit, cleverness, and down-to-earth wisdom of the Chinese people in this choice selection. It's the Chinese Year of the Dog, and as Pacy celebrates with her family, she finds out that this is the year she is supposed to "find herself." Universal themes of friendship, family, and finding one's passion in life make this novel appealing to readers of all backgrounds. This funny and profound book is a wonderful debut novel by a prolific picture book author and illustrator and has all the makings of a classic. An upper-middle class, white American boy is brought face-to-face with the values, beauty--and challenge--of living among another people: the Eskimos of Barrow, Alaska. Young-sup and Kee-sup are brothers in Korea in 1473. A Japanese boy must face life after escaping a tidal wave that destroys his family and village. A little cat and his master, a compassionate artist, bring about a special Buddhist miracle. Written from a Buddhist perspective. One of the best-loved children's books of all time. "Answers" such questions as how the camel got its hump and the elephant his trunk. Farmer. 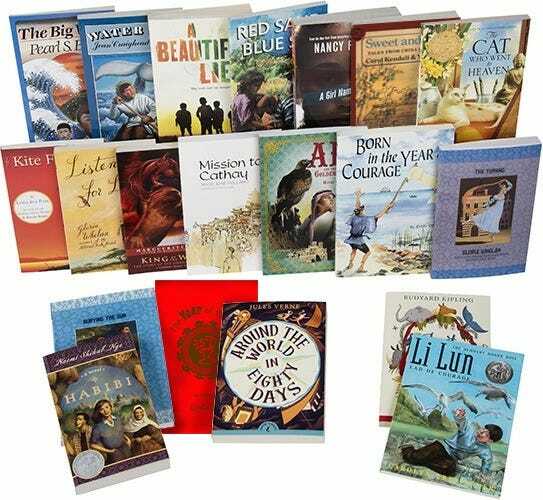 Newbery Honor. After running away to escape an unwanted marriage, Nhamo must find her inner courage to ensure her survival of the dangerous adventure ahead. Whelan. In Leningrad in 1941, Georgi and his family prepare for Hitler's troops to invade. Troops go to the front; Mama goes, as a nurse, to help. His sister travels with the Hermitage's paintings to a safe holding. And Georgi stays and helps with the transport across Lake Ladoga to keep the people in the city alive. A vivid portrayal of life under siege. Beautiful. A winning story of an Arabian horse from North Africa and his adventures in France and England. Whelan. Living in Leningrad in 1991, Tanya's parents must work hard to feed their family. With the Soviet Union on the cusp of enormous change, there is plenty of politics to discuss. Tanya, a young dancer with the Kirov Ballet, considers defecting, as her friend encourages her, when the company goes to Paris. The author worked on the edge of the Saudi Arabian desert in the 1970s. A touching story about a Chinese boy who fails his fishing village's traditional test of manhood. Will he ever find a place in society considering his fear of the sea? A fictional story of Matteo Ricci, the first Roman Catholic ambassador to enter China. An Anglo Australian girl finds herself thrown into contact with an aboriginal girl of the same age who has no use for Anglos. The culture shock for both girls is great, but they come to trust one another by pursuing a common goal in an exciting adventure. Fascinating historical fiction that closely follows the truth about a brave 15-year-old Japanese fisherman, Manjiro Nakahama, who is shipwrecked far off the coast of Japan, is brought to the United States, and, upon returning home, paves the way for Commodore Perry's successful "opening of Japan" to the United States in 1853. When Liyana's father decides to move his contemporary Arab-American family from St. Louis to Jerusalem, Liyana's life turns upside down. Liyana is an outsider who doesn't understand the culture around her. Then she befriends a Jewish boy (a friendship silently forbidden in that land), and things really start to get interesting. British East Africa (today's Kenya) is the only home Rachel Sheridan has ever known. But when influenza strikes down her missionary parents in 1919, she is left vulnerable prey to her family's wicked British neighbors. Rachel's wit, spirit and courage help her press through trials and cling to hope. How can a lie be beautiful? Set in India during Partition (when Pakistan became a separate nation), 13-year-old Bilal is dealing with the impending death of his father. He wants his father to die in peace, without knowing about the upheaval all around. An engaging story in a vivid setting at a unique time.